Contact the club to obtain a breed brochure ! Is An English Springer Spaniel the breed for you ? What are the qualities you're looking for in a dog? Do you want a beautiful pet and a good family dog? The English Springer Spaniel's athleticism, beauty, medium build and active personality may be just what you're looking for. Although the exact origin of the English Springer Spaniel is not known, it is generally agreed that, like all spaniel breeds, their first home was in Spain. The English Springer Spaniel was first recognised in England as an official breed in 1903. The first Field Trial Champion in the breed was in 1913. Since that time the English Springer Spaniel has a become a popular breed in the UK, USA, Canada, Scandinavia and across Europe. Springers are cheerful dogs with a sense of humour. They are affectionate, good with children and noisy with intruders. If you're looking for a guard dog, consider another breed! Although its barking might deter an intruder, the typical Springer temperament is that of a loving, gentle (though active) dog. At best, the Springer might immobilise an intruder while attempting to be petted. English Springers make excellent house-pets and thrive with moderate exercise, though some Springers can be high energy dogs. They are actively represented in obedience, agility, fly-ball and therapy as well as being fine hunters, show dogs and companions. If you are interested in participating in these or similar activities, the local breed club can point you in the right direction. If you want a one-person dog, or if you are away from home a great deal, you might consider a different breed. Springers are intensely people-oriented and are not happy as full time kennel dogs. This does not mean that they should not be confined. Any responsible breeder will ask you if you have a fenced yard or kennel in which to protect your dog. Most breeders, in fact, will hesitate to sell a dog to someone who does not have a facility in which to confine it. Strong, merry and active are three important words when talking about the English Springer Spaniel. It should be remembered that this is a breed that was developed to work, therefore Springers benefit from being trained, be it for a formal discipline or merely to take its place in the family home. All puppies need time and patience and Springers need as much as any other, perhaps a little more than some of the less energetic breeds, but they will reward you with love and devotion, not to mention a great deal of fun, if you give them the right grounding. They are equally well suited to living in the town or country providing that you have a well fenced garden and once they are grown, the time to exercise them both in body and mind. As with any other breed of dog the English Springer Spaniel is not recommended to anyone who is planning to be out all day leaving the dog on its own; dogs are pack animals and therefore do not take kindly to solitary confinement. The English Springer Spaniel was originally bred as an all-round hunting dog, requiring a great amount of stamina and independent thinking in order to complete this type of work. A Springer thrives when given the opportunity to perform tasks, whether it is following you around the house; announcing visitors; performing tricks, obedience, conformation, agility, hunting, tracking or anything else that might include them in your daily routine. Obedience training your Springer at an early age is very important as this helps to develop a bond between you and your dog as well as making them more manageable to live with. A properly trained and well socialised Springer is a wonderful pet for all ages! The English Springer Spaniel is a dog characterised by long, drooping ears, a medium to long coat, a happily wagging tail. They have a kind and friendly expression. An English Springer Spaniel stands at around 20 Inches tall at the shoulder and weighs around 20 kilo’s. They may be black and white, liver and white, or either combination with tan points also known as tri-coloured. They can be with or without ticking or freckles. Each English Springer Spaniel has its own unique & individual coat marking. The coat texture and amount of coat varies according to bloodlines. Coats should be of medium length, flat and should have a glossy and healthy appearance. 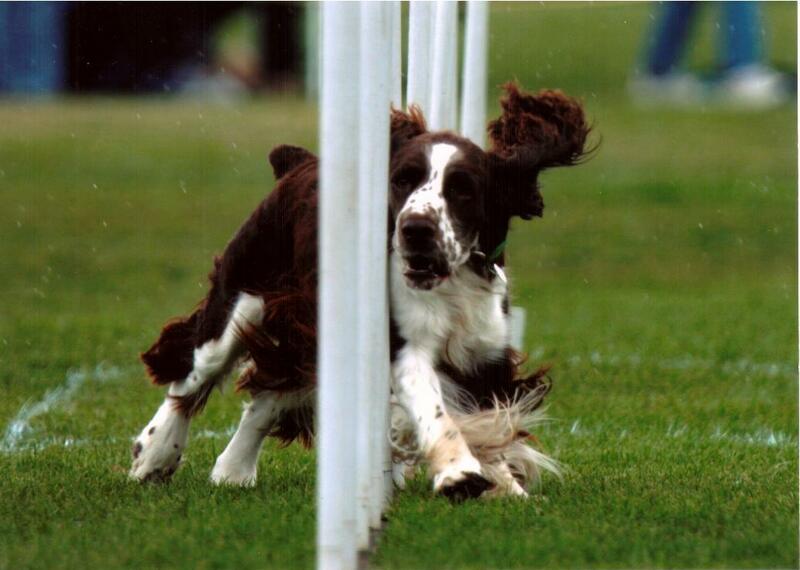 Previous to 2004 most English Springers had docked tails. However since that time a ban on tail docking is in force so you will now notice an English Springer Spaniel by his long wagging tail. An English Springer Spaniel approaches maturity at around 3 years of age. Until this time he is very much still a puppy. Like most other breeds of dogs, the English Springer Spaniel can be prone to hereditary diseases. These may include hip displaysia and eye disorders. Purchasing your puppy from a reputable breeder who regularly tests for these sorts of disorders will give you the best opportunity to obtain a healthy happy English Springer Spaniel. So which English Springer spaniel, male or female would suit your family best ? This is an individual decision, but there is very little difference between genders in Springers. Neither is easier or more difficult to train or housebreak; both are equally intelligent and affectionate. Both males and females should be excellent family dogs and companions. Males can be somewhat larger and heavier in build than females, and males generally carry more coat than females. If you are considering including an English Springer Spaniel as a family member, please make enquiries with reputable breeders. We do not recommend you purchase your puppy from a pet shop or a puppy farm. A reputable, responsible breeder will show you a clean environment, healthy, well socialised puppies. You should be able to meet the dam or mother of the litter who should display good temperament. A Springer with good temperament should be friendly, easy-going, and relaxed. Be cautious about any breeder who must make excuses for the behaviour of their dogs. Over and above anything else, the most important thing when you first meet a Springer is that he or she must show neither aggression or timidity. A responsible breeder will not breed with such animals. A reputable, responsible breeder will have questions for you as well. They will want to know if you've owned Springers before, or dogs of other breeds; whether you have a fenced yard; and whether the dog will be allowed to be a member of your family. A responsible breeder will want to know more about you, your interests, and your expectations before selling you a puppy. The first question you should ask yourself honestly, is why do we want a dog? For my son/daughter or children…..
Remember…. being a dog owner entails a lifetime of responsibility. In the case of an English Springer Spaniel this could be for up to 16 years or more. Children love to play and are fascinated with the new puppy once it arrives home, but children's interests and activities change frequently. This may well end up being YOUR dog for life. Most Springers will shed a moderate amount of coat throughout the year. If you are an immaculate housekeeper, you might find a Springer to be more than you wish to manage in this regard; however, almost all breeds of dogs will shed coat. Springers require a certain amount of grooming and trimming to keep them looking neat . It can be very enjoyable to learn to do this yourself; or you can locate a professional groomer to provide assistance from time to time. Regular grooming helps control coat loss, and keeps the coat in top condition. Regular, thorough brushing is required to keep the coat flat & free of dead hair and knots. The hair between the pads of the feet should be kept trim and nails need to be cut regularly. Ears must be checked and/or cleaned at least once a week because Springer's floppy ears can be prone to infections. English Springer Spaniels are wonderful family pets and companions. They are loving, devoted dogs, eager to please and beautiful to look at. Because they are of medium size, they can live comfortably in city apartments (with proper exercise, of course) or large country homes. The English Springer Spaniel is a dog for all seasons, an endearing energetic companion for the owner who is willing to give it the time that it deserves. Highly thought of by the police as sniffer dogs, well known in the field trial world for their tireless enthusiasm, a joy to behold when moving around the show ring in their own distinctive style, a wonderful family pet and a good companion for young and old alike. The time and effort you spend to find the right Springer should reward you with a wonderful companion for many years. 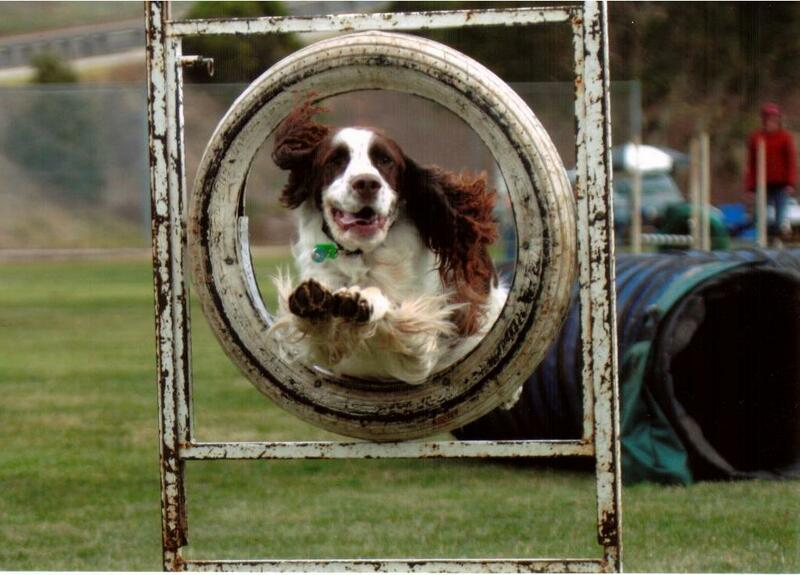 The English Springer Spaniel Club of NSW has been established since 1969 and supports the breed in many ways. We regularly hold annual events including a fun day each July in Sydney, where owners can bring their English Springer Spaniel along to enjoy a sociable outing, meet other Springers and their families. We also encourage visitors to participate in events such as fancy dress, egg and spoon races and waggiest tail competitions. The club also supports the breed by way of a rescue service for English Springer Spaniels in need.